Over the years as an art educator, I've continually stressed to families the importance of providing an art space for their budding young artists. I cannot emphasize this enough. If you want your child to be creative, they need a space to create that's all their own. There is nothing magical or complicated about this. It's super easy and fun to put together a dedicated art space in your home. You will need to look at your home and see if you can find a spot where you can fit a table, a seat, and some limited storage. While the dining room table is great—and believe me, my table has the battle scars to prove it has seen its fair share of projects—it is not ideal. A.) You generally want your table to look nice—meaning you can actually see it, instead of piles of papers and supplies all over it. B.) You do eventually have to eat meals there, and it's a pain to have to relocate all of those piles somewhere else! As you can see, this is not a huge space, just a piece of a galley-shaped room. I did have the bonus of flooring, rather than carpet, and some natural light, because this space is near a glass door and window. Your spot might be under a window, behind a free-standing bookcase or room partition, a niche under the stairs, a closet whose doors have been removed, or maybe you have an entire room that is rarely used and just waiting to be repurposed for creative endeavors. Look at your space with fresh eyes and see where you might be able to fit a small desk or table. It is also helpful to be near an electrical outlet in case you need to plug in a lamp, glue-gun, sewing machine, lightbox, etc. I bought this table and stool from Ikea, based on the measurements I took from the wall and floor space I had to work with. My daughter has grown just enough that one of those cute little toddler tables was going to be too small, and I know from my own art-making experience, you simply can never have enough work space, so I opted for the Pahl desk, in blue and white, which has a good size tabletop and is adjustable to three different heights. I also purchased the Raskog stool, because I liked the option of being able to tuck the seat completely under the table, since this little nook is in a high-traffic area. You will need some simple containers and a shelf or cart for supplies. I believe children create best when they have a variety of supplies at their fingertips. Especially in the early years, art-making is all about the process, which involves a great deal of experimentation. Children learn through doing, so the more stuff you give them to manipulate, the more they will begin to intuit what they can do with the supplies and the kinds of mediums they prefer. I realize not every parent is comfortable giving their child carte blanche with paints and permanent markers, and I also realize not every child has the personality to handle those supplies responsibly. I leave out supplies that don't really make a huge mess. For my daughter's table, I bought the Ikea Sunnersta rail and hanging containers to hold, pencils, crayons, pens, pencils, markers, paintbrushes, etc. The cups can pop off the rail when she's using them and they also attach easily to the edge of our Raskog cart (see below). A supply of paper is always accessible to her. I realize for some of you, the thought of leaving markers out causes visions of ruined furniture to dance before your eyes, and that's why I say, use your best judgement. My daughter has a careful temperament by nature and is old enough that I can get away with leaving out some supplies other children might go crazy with. The idea is to allow access to as many types of supplies as possible without risking your house getting turned into a graffiti showcase! Then, in a separate area, I have the messier supplies. These are the ones she knows to ask for help with like acrylic paints, printmaking inks, clay, etc. They are there for her to look through and pick out; she just knows to ask for help when preparing a palette of paints or changing dirty water for her watercolors. I try to be very accommodating whenever she asks to use these. In our space, the Raskog rolling utility cart from Ikea works really well. We have it right next to her work table, and my little Project Artist can choose her paint brushes and paint colors. I also keep a supply of wet wipes on the cart for her to use for clean-up. Finally, in a third area, I have labeled bins for other supplies that are used less frequently. These clear shoe boxes allow me to see what's inside, and as you can see, I relish every opportunity to use my label maker! This shelf is in the laundry area near my daughter's art space. I also have a closet in the family room next to her desk that I dedicated to art storage. I don't like a lot of clutter, so I really love having this closet that hides all the craziness behind these Ikea sliding panels. Being an art teacher, I have more than the average person's art supplies! Plus, I have a persistent, lifelong habit of seeing random things and thinking, "I could make something with that!" I do my best to keep it organized so I can find it when I need it. Art just involves A LOT of stuff!! If you don't get yourself organized, you will be swallowed up in piles of supplies and never be able to find the dowel rods or ink pads or metallic paints when you need them. You will need to surround your child with a variety of visual stimulation and materials that pique their curiosity. 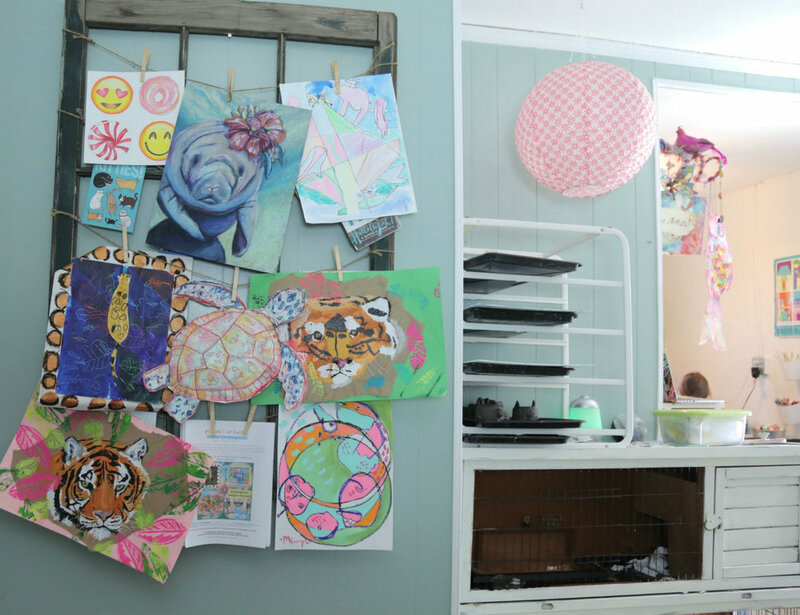 You'll want to decorate your child's art space with a few touches that reflect their personality or interests. You'll also want to include a place to display their creations. We found a fun Japanese lantern at Ikea and dip-dyed a felt circle garland to hang up my little artist's creations! I also turned an antique window sash into another display area. But way more important than the look of the space, is what you put IN the space for your kids to play with. The key words here are VARIETY and MATERIALS. As stated above, lots of colorful supplies are always accessible in my daughter's art space, but what I also love to do is leave little art surprises for her. I periodically set out a collection of items or supplies she hasn't seen before and ask her to see what she can do with them. Sometimes it is some pretty painted paper scraps, scissors, and glue. 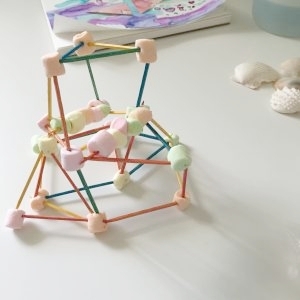 Sometimes it's marshmallows and toothpicks—because who doesn't love art you can eat? Sometimes we find things outside on a walk and bring them in to her desk. Sometimes its a salt shaker and glue. The new objects, plus the supplies, always get her creating. I even made a special basket that I routinely fill with new objects for whenever she needs some fresh inspiration. You can print pictures of something from the internet and scatter them around their art desk. A pile of old cereal boxes and tape could randomly appear on their table and get them inspired to build a sculpture. Several rolls of washi tape and paper can inspire something fun. Sometimes, when I'm too tired to think of something new, I just fill up her water container and set out the watercolors with a fresh sheet of paper. I think she appreciates having the set-up waiting for her without having to ask me first. This concept is known as an "invitation to create", which I define as an inviting display of supplies that draws a child into the art-making process. The variety of options, plus the novelty of new things appearing, keeps my little Project Artist visiting her art space continually and super motivated to create art! Set-up a simple table and seating area. Make supplies readily available to your child using a variety of storage solutions. Provide a variety of fresh inspiration for your budding artist. For further inspiration on this topic, I recommend you visit my friend, Megan Schiller's site, The Art Pantry. 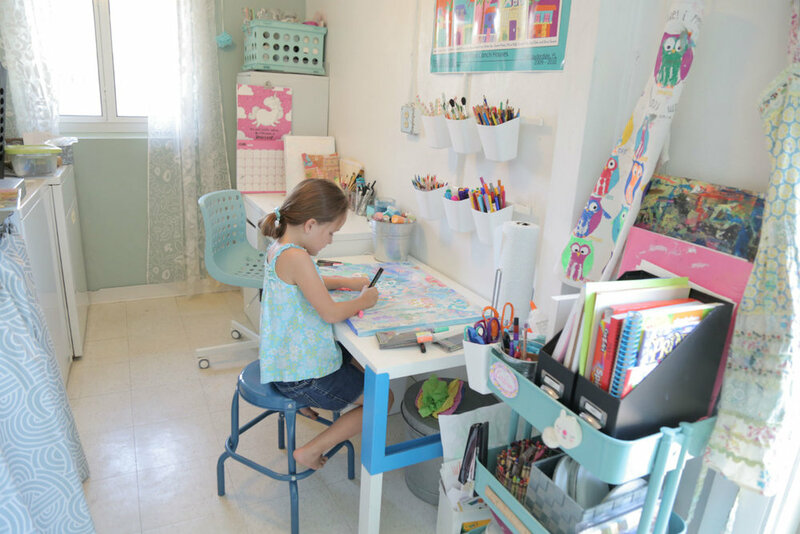 She provides a wonderful service called Design Camp that walks you through the process of decorating a kids' art space--you can even hire her to design it for you! Or, you can also check out my Pinterest page on Kids' Art Spaces for some DIY inspiration. Have an art space but aren't sure how to handle the mess? Click here and I'll send you my Quick and Easy Clean-up Tips!